There's one picture of Ariana Grande everyone seems to be talking about right now--and it's not one from her Grammys Night. 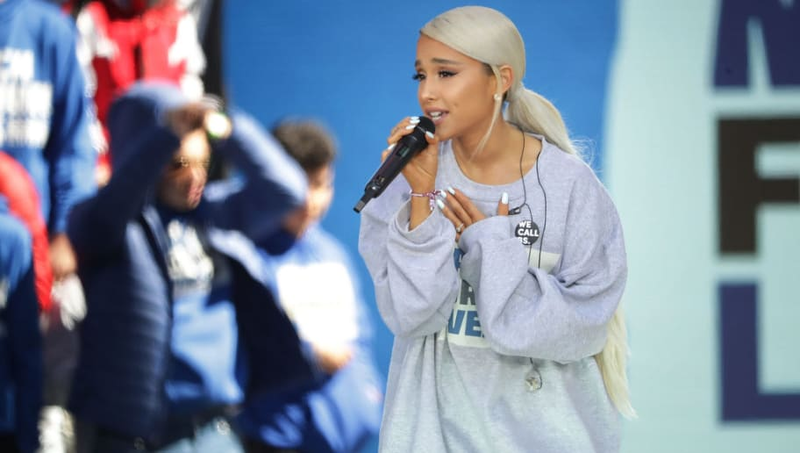 The "7 Rings" singer posted an adorable throwback recently from a local newspaper article she was featured in after being hit with a hockey puck at a Panthers game not once, but twice. Celebs: they're just like us. Following her sharing the adorable throwback, a fan questioned whether or not she would be growing out her curls again, to which the 25-year-old singer replied, "they gotta grow first ! that blonde last year …….. tarnished. BUT they’re like halfway back. :)"
Afterwards, when fans began to beg for pictures of what her hair looks like naturally now, Ariana replied with a quick video using a dog-eared filter to show eager fans how her curls were doing. Fans are of course now shocked and obsessed with the natural look which we never get to see. The original picture of Grande has become somewhat of a meme, especially following her Grammys win on Feb. 10 when a fan edited the snap to reflect the situation. We're absolutely here for Grande's throwback, and we also love the idea of her growing out her natural curls again--as long as she still wears her iconic ponytail from time to time.